We help families resolve conflict! In Massachusetts the division of marital property in a divorce case is controlled by M.G.L. Chapter 208 Section 34. If you resolve your case through settlement, Collaborative Divorce, or Mediation, you and your spouse can decide how to take into account all of your particular circumstances, but you should still know the law. Below we have provided answers to many of the common questions that we are asked about property division in a Massachusetts Divorce. If you would like more information please do not hesitate to call us at 508.655.5980 or e-mail us. Are retirement accounts and pensions considered marital property? In Massachusetts, the divorce court has the ability to divide retirement accounts and pensions. Whether or not all or part of a retirement account is considered marital property depends on the factors in M.G.L. Chapter 208 Section 34. If a retirement account is considered marital property it may be divided or transferred just like other marital property, regardless of original ownership. Unlike withdrawing funds from a retirement account in other circumstances, as part of a divorce, ex-spouses are permitted to transfer retirement assets without a taxable event. This one-time IRS exception allows ex-spouses to divide retirement assets equitably without incurring negative tax consequences to the division. The document required to complete this transfer is called a Qualified Domestic Relations Order (“QDRO”). 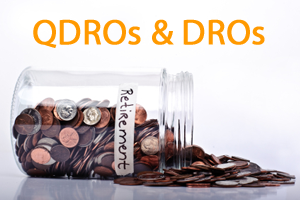 Many companies, like Gray Jay Endeavors, LLC offer flat fee preparation of QDROs. Click here to learn more about QDROs. What is considered marital property in Massachusetts? In short, this means that all assets owned by both parties are considered potentially marital property and can be divided or transferred by the court. How is property divided in Massachusetts? The court has broad discretion in how to apply these numerous factors. In short term marriages, the court often tries to put the parties back into the position that they entered the marriage when possible. As parties remain married longer, the court is more likely to consider property merged into the fabric of the marriage and begin by considering an equal 50/50 division. The factors can then sway the court to vary from an equal division depending on the circumstances of the case. How are liabilities treated in property division? The Court has the power in a divorce case to order responsibility for liabilities, including credit cards, loans, and tax liability incurred during the marriage. How are trusts treated in a divorce? The Judge in a divorce case in Massachusetts can consider how to divide all property that is in the name of either person, and this includes property held in trusts. Whether or not a trust is divisible as a marital asset depends on the type of trust and how it may have been used during the marriage. In Ruml v. Ruml the court indicated that a trust could be martial property, especially if it was accessed during the marriage. Ruml v. Ruml, 50 Mass. App. Ct. 500, 512 (2000). In Ruml, the court elaborated that “trust assets where a spouse holds powers, such as the power of appointment of trustees, are subject to equitable distribution pursuant to M.G.L. c. 208 Section 34. In some instances, though, the beneficiary does not have any powers, and it is completely up to the trustees to decide how and when the property will be distributed. These are called spendthrift trusts and they may be protected in a divorce if the trust truly has been treated as a spendthrift trust. “Trusts containing spendthrift provisions of the type under consideration in this case are recognized as valid in Massachusetts.” Pemberton v. Pemberton, 9 Mass. App. Ct. 9, 19 (1980). “Moreover, in Massachusetts the settlor’s intent to deny creditors of a beneficiary recovery against trust assets or recovery against the trustee’s wishes has been accorded particular deference, even in the face of strong public policy arguments favoring such a recovery.” Although some scholars suggest limited authority to allow wife and dependents to pierce a spendthrift clause, there is little authority which allows a court to order a trustee to do so over the objection of the trustee. The Judge in a divorce case could award other assets to offset the value of trust proceeds to one spouse, but according to Pemberton if the trust hasn’t been invaded during the marriage and is a spendthrift trust than a Judge cannot order the trustees to pay assets to the beneficiary’s spouse against the intent of the trust. Click here to learn more about Alimony. Skylark Law & Mediation, P.C. is committed to ensuring its services and content are available to people of all abilities. Read our Accessibility Statement for more information. © 2008-2018 by Skylark Law & Mediation, P.C. (formerly Kelsey & Trask, P.C.). All Rights Reserved. Visit our Copyright page for more information.